You are here: Home > News > Ewart’s Warehouse: No to Demolition. The independent report, commissioned by the Department of the Environment, states that ‘Demolition of the building for reasons of structural deficiencies is considered unsubstantiated’, describing the building as ‘robust’ and ‘capable of refurbishment’. This echoes concerns raised by the Society in 2015. 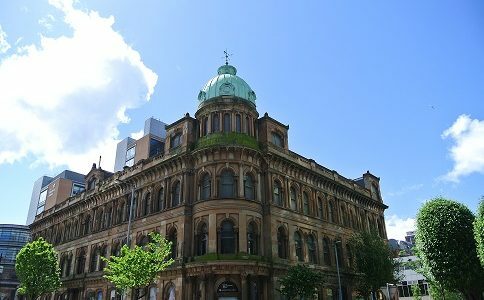 Despite planning approvals being granted for re-use of the Ewart building in 2006, new plans for ‘grade A’ office accommodation and underground parking cite major structural failure as justification for demolition. According to the independent survey, the alleged structural failure is, in fact, unsubstantiated. Whilst the application suggests ‘refurbishment’, the scheme actually proposes complete demolition of all but two facades, and the replacement of the building with a completely new structure to the rear. The UAHS welcomes the re-use of buildings at risk, when proposals are sympathetic and appropriate to our historic environment. Ewart’s is a building protected by its listed status. If approved, the proposal implies the loss of plan form and quality and survival of interior that are specifically mentioned as being significant to the buildings designation. We recommend that proposals for the new build replacement are also contrary to the policy for the protection of the Linen Conservation Area. 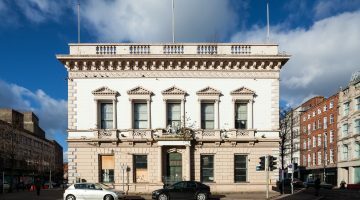 The Ulster Architectural Heritage Society maintains that the application should be refused and the applicant asked to investigate alternative, heritage-led solutions for the retention, extension and alteration of this landmark Grade B+ listed building.